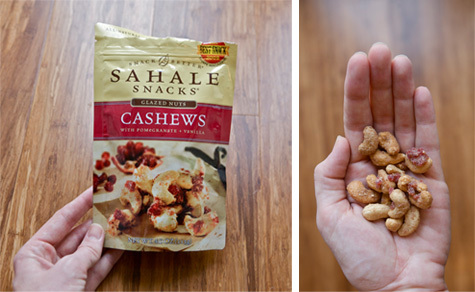 Easy Vegan: Sahale Snacks Review And Giveaway! ‘Easy Vegan‘ is all about practicality. Sure, in an ideal world we’d prepare each meal at home, from organic fresh-from-the-field produce. But what about when you’re held up at work and get home *starving*, with no motivation to cook? And what about when you’re visiting Uncle Bob, in nowhere-ville, and there’s nothing fresh to eat? Or what about when you’ve got that ‘fast/greasy/naughty food’ itch that just really needs to be scratched? What then? For times like those it’s good to know what’s worth grabbing – and what’s better left on the shelf. Hence, the ‘Easy Vegan‘ guide. Our Thoughts: The ingredients sure sound like overkill, but the flavor is totally balanced and nothing overwhelms . Sweetness from the apples leads into a well-rounded and complex flavor profile. The aftertaste is just the tiniest bit of heat – a nice little kick! I agree. And we both gave our thumbs up. Would eat again! Our Thoughts: Okay, I gotta admit I was skeptical at first. It was the vanilla that threw me. But wow, guys, these sort of blew my mind! Very sweet but also complex, I was reminded of the Pralines & Cream ice cream that was my favorite as a child. Such amazing flavors! The only problem I have with these is my potential to eat the whole bag. NOM. So guys, now that you’ve read the reviews, here’s the fun part: Sahale Snacks is giving out a gift pack just like I got, to one lucky Bonzai reader. 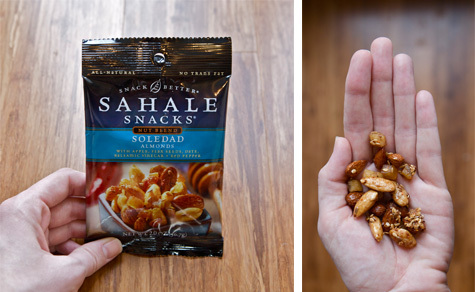 You’ll receive both flavors of vegan nuts and maybe a little something extra as well. All you have to do is leave a comment here! I’ll use the random number generator to choose a winner later this week. Good luck! Free nuts? I am all about free nuts! yeah! They are the best! Holy Toledo, what a yummy giveaway!! Thanks! I’m excited to try out the new recipe for dishwasher detergent. Your an AMAZING lady……keep up the GREAT work. Thanks for the chance to win. The vanilla cashews look delicious. I would love to try them. I love to snack on nuts they are great! The contest is now closed. Thanks everyone for entering, and for all the sweet comments. You guys are the best! @ Kelly – I have not read The Omnivores Dilemma, but I have read and reviewed In Defense Of Food. I understand Pollan’s thesis as presented in The Omnivores Dilemma and don’t feel like I need to read it. Yes please, I would love to try their products—Ive been drooling over them for a while. my co workers and i nom these at the store quite often! i love each of these!